Electrical relays are one of the important electrical devices that are used in many heavy-duty machines, such as air conditioners. These devices may be less known to common men, but any person having some technical knowledge probably know about it. Let’s understand these devices and their usage in more details. Relays are the electrical switches similar to the buttons on your electrical board for turning ON and OFF certain device. The basic purpose of a relay is similar to a switch, but they are slightly different. Relays can be turned ON and OFF by electric current, unlike a button which needs to be physically turned ON and OFF. For example, if you want to turn ON a relay which is normally OFF, you have to supply an electrical current to its sensing element. This property of relay to be turned ON and OFF electrically without the need for manual intervention is very useful, which you will know as you read the article further. All the relays can be categorized into two broad categories; electromechanical relay and solid state relay. Electromagnetic relays – These relays use an electromagnet and some moving parts for functioning. 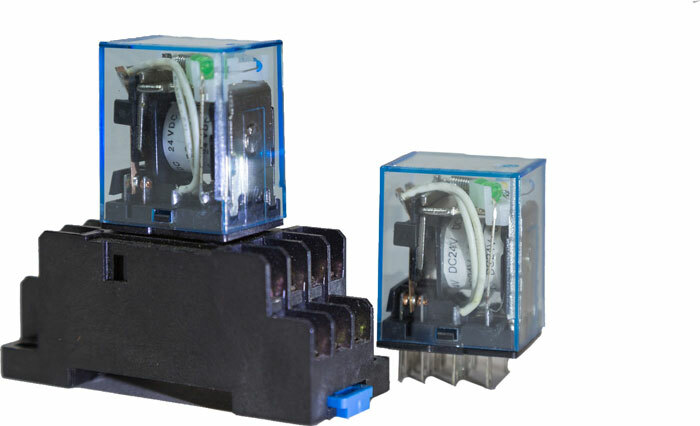 Solid State Relays – These relays don’t have any moving parts and are more efficient and reliable than the electromechanical relays. A simple electromagnetic relay is made of an electromagnet, some moving parts, and contacts. The electromagnet is used as a sensing element which when receive electrical current, it closes or opens contacts of the relay – depending on relay type – to turn ON or turn OFF the load, e.g. compressor of an air conditioner and electricity supply to the home. The load can be any electrical device which you want to switch with a relay. The supply of electricity to the load goes from the contacts of relays which are opened and closed by an electromagnet when they receive electrical signal at their sensing element. Solid state relay works very differently than electromechanical relay; they don’t have any moving parts. They rely on properties of the semiconductor for functioning. These relays are very reliable, durable, and fast compared to electromechanical relays, but they are very costly. If we can switch a load with the help of a button on the electrical board, then why there is a need of relays? As I mentioned before, relays have the property that they can be switched electrical without the need of our physical intervention. For example, If you want your water pump to be turned off automatically when the water tank of your house fills completely. Then, you will use a relay and a kind of sensor for sending an electrical signal to relay when the tank fills completely. After receiving the signal, the relay opens its contacts to turn OFF the water pump. Switching ON heaving loads, such air conditioners or heavy motors, with the help of very small electrical current. For protection against short circuits, over-voltages, and under-voltages. When the protection relay will sense any of these conditions it will turn OFF the loads to avoid damages. Selecting between many loads. For example, you can use a relay to select and turn ON heater if the temperature drops very low, and select air conditioner if the temperature goes above the normal. Relays can be used to perform some arithmetic operation in computer applications. The first relay, that was an electrolytic relay, was designed by Samuel Thomas in 1809. Electromechanical relays were originally developed to transmit and receive telegraphs in 1840. Abdul Wahab, "Relay," in Science4Fun, April 12, 2019, http://science4fun.info/relay/.